Helping a client gain an in-depth understanding of current airflow performance within the data centre can be provided as a standalone service or as part of a wider review of data centre environmental management effectiveness and efficiency. 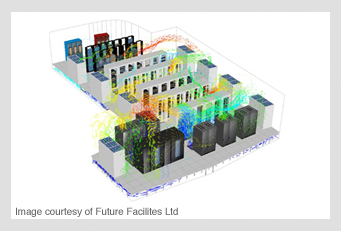 Airflow modelling uses Computational Fluid Dynamics (CFD), a software tool for modelling how air streams and velocities are generated and perturbed by infrastructure within the data centre. CFD can show areas of starvation, extreme temperatures and even simulate CRAC failures and how that affects the white space environment. To effectively model the air dynamics of a data centre, engineering drawings and the list of equipment occupying the data centre must be uploaded. The results are checked against physical measurements and models refined if necessary. The validated model can then form the basis of 'what if' scenario analysis including the effects of air containment installation. 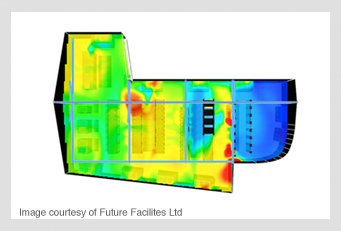 Frequently CFD reveals hitherto unrecognised defects in data centre design or divergence from efficient operation that has arisen through the process of change. The output generated from the assessment gives a conclusive report which will be presented in a format to enable discussion on next steps which may include options for air containment solutions.